To help Kevin from being taunted by one of his friends, Lucy trys to pass off his teddy bear as her own and sticks it in a bag. But during the family yard sale, the bag is sold with Kevin's teddy bear, Charley, still inside. Lucy, feeling responsible, puts up reward posters around town. The woman, Mrs. Loomis, then comes looking to pick up her reward. Lucy offers her the fifty dollars, but she demands five hundred dollars instead. Lucy gets angry, and takes the greedy person to small claims court, representing herself. 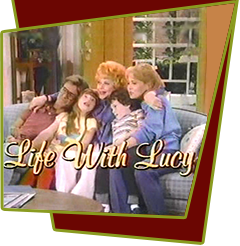 Special Notes: Lucille Ball of old emerges in the courtroom scene, while dressed in a man's tailored suit, with suspenders and floppy bow-tie, one cannot help but think of Lucy Ricardo.